Now that summer has officially kicked into high gear, the light, sweet and tangy flavor of citrus is oh so refreshing. Due to El Nino, shoppers can get sticker shock over the high prices of produce, especially if you’re based in Florida. But, this bright infographic by Tasty Catering out of Chicago has come up with some interesting and fun ways to extend the uses of oranges. There are very few scents that smell more divine when cleaning than orange oil. Orange oil is a natural but powerful solvent. You can use the discarded orange peel directly to scrub your stove or sink, or infuse the peels in vinegar to spray thoroughly on your counters. To keep that light scent in your home longer, add your discarded peels, cinnamon sticks and cloves to water and boil on your stove. 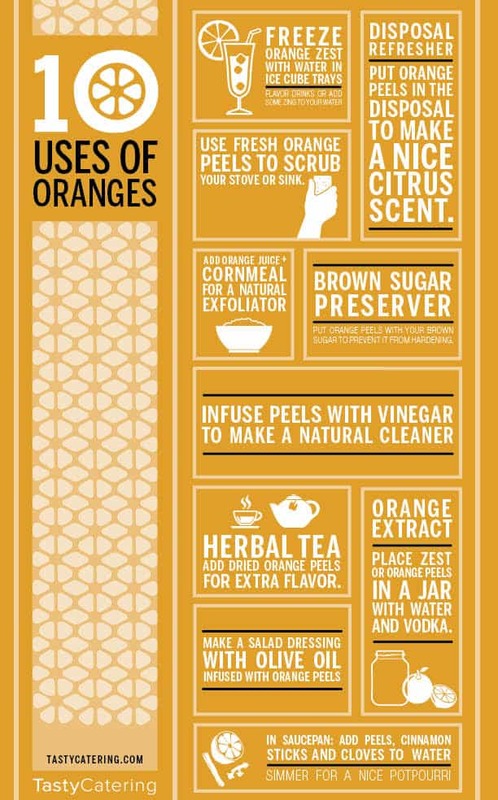 To read more uses of orange peels, see the infographic below. Coming to you in a limited edition batch, literally made from San Francisco Fog, is a new beverage from my old friends at Hangar One (who I have photographed on several occasions). Bay Area residents are very passionate about sustainability and local production, and out of this devotion emerges…vodka: Fog Point vodka. FogQuest, an organization known for collecting water made from fog for sustainability, helped them set up fog catchers—sheets that absorb the water as the fog floats through them. The drops are caught in a trough below, allowing them 2400 bottles of production. And, there is no one more devoted to incorporating local community of flavor profiles into his products than Lance himself! So the $125 a bottle question: what does it taste like? Buy a bottle and give it a try. How often do you have the opportunity to literally consume a piece of California weather? The Dieline is, for the most part, a website devoted to package design and has expanded its content to include an annual design competition, now in its 6th year: The Dieline Awards. As I aspire to shoot more packaged goods in my own work, I’ve become a huge fan of the site and all of the amazing work, and designers, they profile. Very aspirational! The Dieline has recently announced their 2016 winners, and I wanted to share them with you. There are some stunning package concepts, which you can view here. But one of my favorites, no surprise, is the chocolate! XOXOLAT (sho-sho-la) is a Vancouver company, and retails Canada’s largest selection of single origin chocolate bars. Another of my personal favorites is the tea boxes made by Old Master’s. Old Master’s Private Tea packaging reflects its old world values in this simple but elegant packing. And for one of the most creative networking cards, I love Just Design. Talk about a creative “thanks”! You can enjoy all the winners, as well as the honorable mentions, here. I’ve had the pleasure of photographing Chef Dominique Crenn on more than one occasion and year after year, she is killing it! Recently, she’s been honored as the world’s best female chef 2016 from San Pelligrino’s The World’s 50 Best Restaurant’s list – she’s making SF proud! But that’s not the only recognition she’s racked up. She’s also won the title of Best Chef of the Year in 2015 from Eater. And although she didn’t win the James Beard award for chef or for her restaurant Atalier Crenn, she was a runner up for this prestigious honor. The Young Audiences of Northern California’s Indiegogo campaign has been launched! I sit on the board of this worthy endeavor, and our goal is to raise $10,000. You can help me bring arts education to even more Bay Area kids next year. Your contribution will make a difference in the lives of children in our community. Give, claim a cool perk for your generosity, and then, consider sharing our campaign with your friends and colleagues so they can make a contribution too. This may sound like Greek, but these are actually useful terms to understand in the graphic world. Pagemodo has created an infographic to help translate designer jargon to the novice. For instance, we all use PDFs, but do we know what makes them easy to use? Or, the difference between it and a PNG file (Portable Network Graphic). It’s great for use on the web because it retains much of its data. Two other good terms to know are RGB and CMYK. Undoubtedly, these are familiar to those who are photoshop savvy , and which as photographers, we use a lot……especially when our images are going to print. Something I use quite often is web colors. A web color is a 6 digit hexadecimal color code to identify specific digital colors. For instance, the pink in my logo is color code # f7adce. You can click on this image for more interesting terms, such as UI, white space and bleed. Now through April 17, join Nordstroms as they munch their way through a special kitchen and pantry edition of their monthly online Pop-In Shop, curated by food enthusiast (and VP of Creative Projects) Olivia Kim. Inside you’ll find delicious nonperishables you can eat right now, condiments in flavors you didn’t know existed and kitchenware to help you prepare for yourself or a crowd. Need help with recipes? The group is calling on world famous chefs for some inspiration. For instance Rachel Yang , currently in the running for a James Beard Award for Best Chef Northwest, shares a recipe for a Sichuan-spicy spin on biscuits and gravy using ingredients you can find in the Pop-In. You can shop for all the items featured here. A couple of weeks ago, I posted a preview of an exhibit I am in with terra cibus no. 18: sugar. It is “Nourish: Food as Sustenance and Pleasure,” and runs now through March 9th. It was curated by the talented Dr. Rebecca Senf of Center for Creative Photography. If you aren’t in the vicinity of Texas to enjoy the artwork in person, here are a few images to get a sense of space. I am excited to announce that one of my fine art images, terra cibus no. 18: sugar, will soon be on exhibit at the Texas Women’s University School of the Arts. This year’s theme for the 15th Annual Joyce Elaine Grant Photography and Solo Exhibition is "Nourish: Food as Sustenance and Pleasure," and will run February 15 to March 9, 2016. This annual event began in 2001, and is organized by the graduate photography students at Texas Woman’s University and the Photographic Artists’ Coalition (a student-run photography organization). Each year, a distinguished female curator serves as juror for the exhibition and selects images from entries submitted by photographers throughout the United States. This year’s curator is Dr. Rebecca Senf, of the Center for Creative Photography and the Phoenix Art Museum. I showed my series to Dr. Senf a few years ago in Portland at PhotoLucida, where terra cibus first got a lot of traction. It’s great to be included in one of her shows, but also to see the increased attention to food having a place in the art world. If you find yourself in or near Denton, please drop in and have a look!